Fall in Tahoe is arguably the absolute best time of year for mountain biking. Squeezing in a few extra rides on the mountain bike means cool days, less crowded trails, and perfectly packed singletrack, dampened by the passing rain showers. This is the final opportunity to squeeze in that ride you’ve been dreaming about all summer but still haven’t gotten around to. Here you’ll find the lowdown on the best mountain bike trails to squeeze in before winter hits in Tahoe. The Kingsbury Stinger trail represents an incredible partnership between the Tahoe Area Mountain Bike Association and the U.S. Forest Service, turning formerly illegal downhill trails into yet another professionally-crafted legal trail. The good community vibes created from the building of this intermediate trail match well with the flowing 4.5-mile downhill ride that drops approximately 1,400 feet. Because this trail is located on the drier southeast side of the Lake Tahoe Basin, it should hold good riding well into mid-November until snow starts sticking in the upper reaches. From South Lake Tahoe, take Highway 207 up Kingsbury Grade, After 2.8 miles, turn left on North Benjamin Drive and continue until the road dead ends at the trailhead. This trail is best done as a shuttle system with a second car parked at the former Kingsbury Middle School on Echo Drive. New construction on the lower half of Corral Loop offers challenges for most ability levels. The legendary Corral and Sidewinder Trails provide some of the best singletrack for a range of ability levels in the Lake Tahoe region. 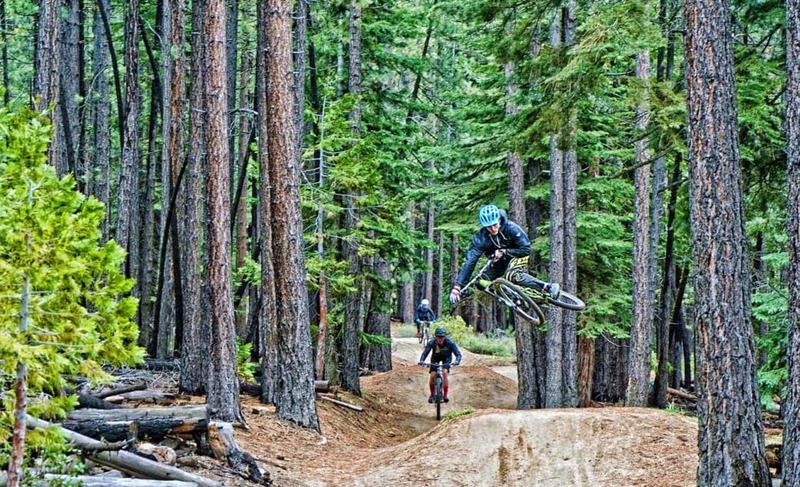 Riders have until mid-November before the Forest Service gates close, cutting off the ability to shuttle and ride a few laps on this insanely fun network of trails. After the gates are closed, riders will have to earn their turns the old fashioned way by huffing and puffing for two miles up the paved road—though this seems to make the downhill even better. This ride is just under nine miles when you take both the Corral and the Sidewinder. From South Lake Tahoe, take Highway 50 toward Meyers, turn left on Pioneer Trail, right on Oneidas Street, and continue on to the service road at the end of Oneidas. 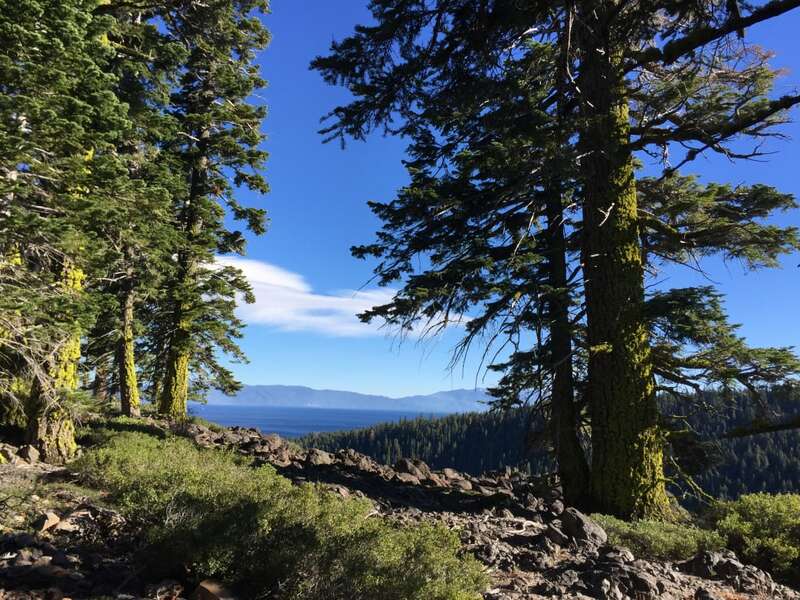 Massive moss covered trees frame incredible views of Lake Tahoe from the Tahoe Rim Trail. Massive moss covered trees frame incredible views of Lake Tahoe from the Tahoe Rim Trail. Often lauded as one of the best contiguous segments of mountain biking in the Lake Tahoe Basin, the 20+ mile segment from Tahoe City to Brockway Summit features incredibly fun, flowing trails that weave through stands of pine and manzanita with breathtaking views of Lake Tahoe. It’s not for beginners, but this trail will be a cherry on top of a season for any intermediate rider who has been building their skill level all summer. This route is best done as a shuttle from Brockway Summit to Tahoe City to maximize the amount of downhill. The big reward here lies in the final five miles of trail that cruise through banked turns and amazing singletrack, dropping about 1,400 feet down to Tahoe City. Be a good ambassador for the sport and share the trail with other users on this popular segment—trail etiquette states mountain bikers yield to all other users. From Tahoe City, take Highway 28 toward Kings Beach. In Kings Beach, turn left on Highway 267 toward Truckee, parking at the signs for the Tahoe Rim Trail trailhead near the top of the summit. This technical singletrack might be South Lake Tahoe’s most accessible trail. Located in the Van Sickle Bi-State Park just behind the Casino Core area, this challenging route flows through dense forest and the open burn scar of the 2002 Gondola fire, providing incredible sunset views of Lake Tahoe on the descent. The Van Sickle trail can be ridden both up and down and provides the perfect opportunity for a quick outing or a full day of laps. Ambitious riders might even be able to ski Heavenly in the morning when they fire up their snowmaking mid-November, then trade in their skis for a mountain bike at the bottom of the gondola for an afternoon ride. See the RootsRated guide for hiking the Van Sickle Trailfor directions to the trailhead. 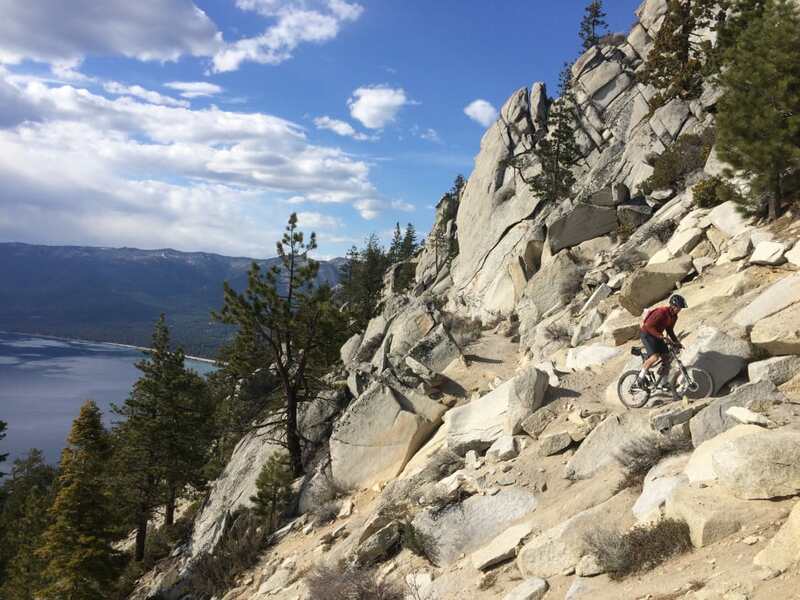 The trails have steep drop-offs, but give way to sensational views of Lake Tahoe on the Flume Trail. If you still haven’t biked the Flume Trail by now, stop reading and immediately go ride this incredible 14-mile downhill trail. It might just be the most scenic mountain bike trail in the country. With abundant fall colors lining the beginning of the trail and vertigo-inducing views of Lake Tahoe as you descend to Incline Village, this is one ride that needs to be done before the snow flies. A paid shuttle service operates at the end of the trail to take you back to your car at Spooner Lake through November. For full details on the shuttle and detailed trail maps, check out the official Flume Trail page. Written by Aaron Hussmann for RootsRated.